Some girlfriends have recently purchased Crock Pots, and I promised them I'd share my three favorite slow cooker recipes ... one of which has made Ian to think I am a kitchen goddess. And it's three ingredients, ya'll -- being a goddess has never been simpler. Before I share the recipes with you, though, I want to show you something really wild. I was given some old family cookbooks, a few of which belonged to my grandmother Gigi. 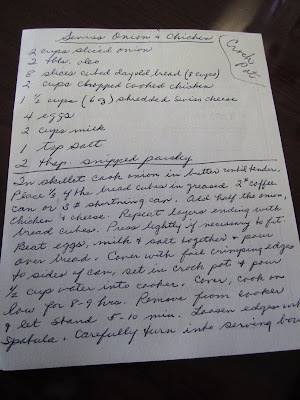 She had some pieces of paper stuck in one of her cookbooks that had Crock Pot recipes jotted down on them. 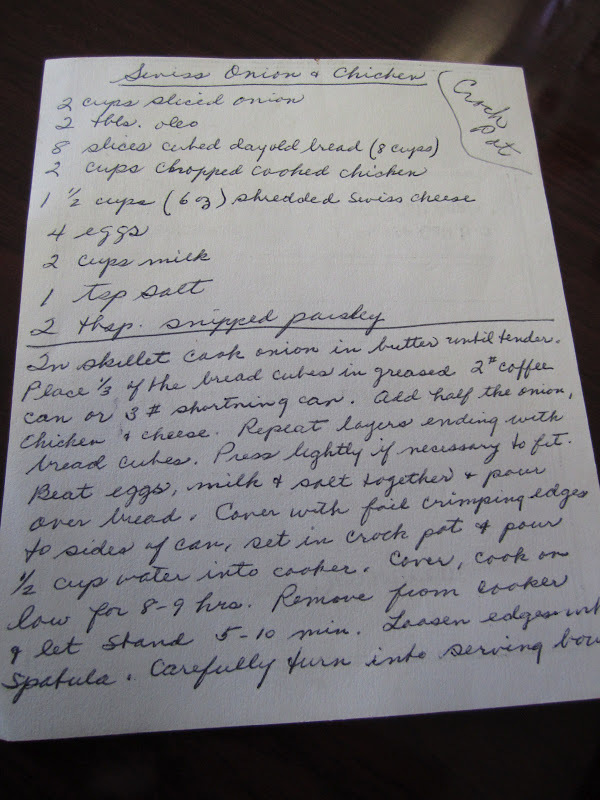 Here's a pretty standard looking recipe from her. Besides the fact that the recipe calls for oleo, it's not too crazy. Well, maybe the fact that you assemble the recipe in a coffee can or shortening ca﻿n and then put the can in a Crock Pot, surrounded by water. That's maybe a little unconventional. My Gigi was a policewoman. To say that this was not a traditional job for a woman at her time would be a heck of an understatement. She worked in the small town of Selma, North Carolina, and she even took my middle sister Sarah and me as young children to her police station and showed us "crack cocaine." By the way, how did that term get so outdated? It makes me laugh. Seriously, I'm giggling as I type this. Crack cocaine. That is just funny to say. 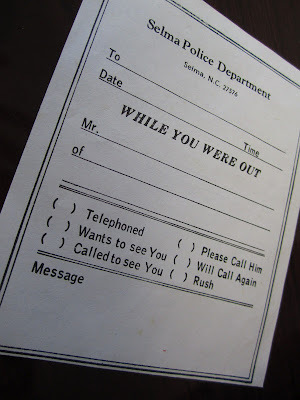 But what really is wild to me is the verbiage on that "While you were out" notepad. Did you catch these parts? I'm glad things have changed now, but I'm also so proud to say that my Gigi was a policewoman during this very time. Convention and tradition were not her style. Okay, back to my three favorite Crock Pot recipes. I'm going to keep the descriptions for these quick and simple, because that's why cooking in a slow cooker is so magical. Place chicken at the bottom of the Crock Pot and sprinkle with the taco seasoning. Add in beans and tomatoes. Cook on low 7-8 hours. Stir when done to shred the chicken. Serve on top of a bed of rice and/or shredded lettuce (we omit the rice). Top with desired ingredients such as shredded Mexican cheese, sour cream, guacamole, and black olives. Combine all ingredients in your Crock Pot. Cover and cook on low 7-8 hours. Serve warm with or without cream. Place pork in your Crock Pot and cover with half of the root beer. Cover and cook 6-7 hours, turning once halfway. The pork will shred easily when it is done cooking. Drain off most of the remaining liquid and pour your BBQ sauce of choice over the shredded pork. Toss to coat, and continue cooking for about a half hour more. You will have half of your root beer left over -- keep in the fridge for your next batch of BBQ. If you're anything like us, that will occur sooner than later. I have had no luck with the Crockpot. Everything turns out bland. I'll have to try the last one. that whole post made me giggle. love it! You should title this post "Crackpot"
Making me hungry, April! 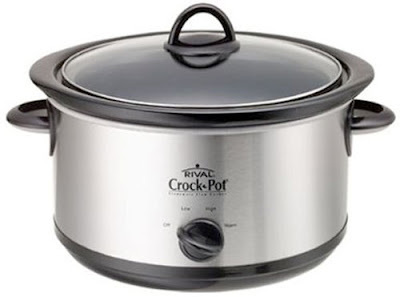 I need to get a crockpot just try out your recipes! YUM! I have an entire pin board dedicated to crock pot meals. I am obsessed with my crock pot!!! I'm going to be the Mexican crock pot Goddess today! Yay -- thanks for the recipes!! I had everything in my pantry but Rotel, so off I sent Bryan to the store... and now I'm crocking! I make chicken like that at least every other week!! I use either a can of rotel or about a half a big jar of salsa - whichever we have on hand. I serve ours on tortillas and then we eat the leftovers the next night over rice (and sometimes I add corn to the leftovers for the rice bowl). Bryce got a crockpot for Christmas so we've been experimenting--I'll have to share these recipes with him! Your grandmother sounds amazing. It is true that it is hard for many of us to imagine living in a world where your caller was assumed to be a man. I will definitely be trying the pork recipe! I have done a very similar Taco Chicken one and it's amazing and couldn't be easier! i love how you grandmother was a policewoman-especially in her time period. i really admire that! These all sound fab! I will have to try the last one for sure! I did a mexican recipe one time that was frozen chicken breasts, can of corn, black beans and I think a jar of salsa. Tasty. I wrote down both of these recipes and I am making the pulled pork tomorrow! I'll let you know how it goes!